I didn’t want to spend money on nice pots, so transfered the plants to mason jars when I got home. 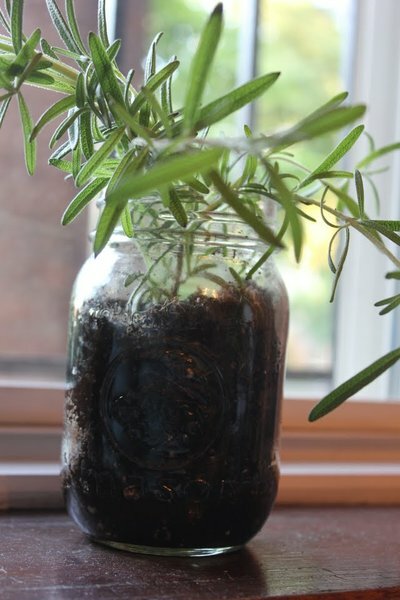 I’m a little worried that clear glass may not be good for the plants because I read rosemary should be kept in containers with good drainage. But I like how the mason jar looks. If all goes well, I am hoping to use rosemary sprigs from this plant through the winter. I’ve been doing some preliminary research and it sounds like this is doable as long as the plant gets a lot of sunlight and the right amount of water. That can’t be too hard, right? This week I made Eggplant Rollatinis with my first batch of fresh rosemary. I love the combination of fresh herbs and cheese and the rosemary was divine paired with goat cheese and chives and then melted into soft eggplant roll ups. I served this with quinoa and a roasted tomato sauce for dinner. While it was a filling dinner, I also think this would be an excellent appetizer served next to a homemade tomato sauce and crusty french bread. Deborah Madison suggested serving this with quinoa. I did this and liked it, but I think the creamy texture of the eggplant and melted cheese would be better complimented by a slice of crusty french bread. Cut eggplant lengthwise into 1/3-inch thick slices. Lay on a baking sheet, drizzle with olive oil, and bake for 15 minutes, or until the eggplant is soft and pliable. Meanwhile, combine mozzarella, goat cheese, scallions, and rosemary. Season to taste with salt and pepper. 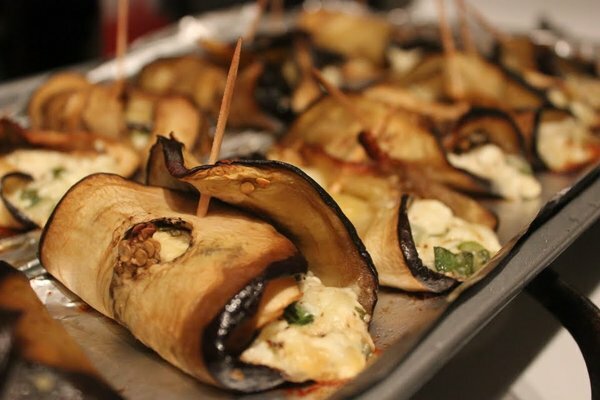 When the eggplant is done baking, place two tablespoons of the cheese filing at the fat end of each piece of eggplant. Roll eggplants into a tube and secure with a tooth pick. Arrange the rolls over a single layer on a baking sheet and bake 25 minutes. Remove from oven and serve with tomato sauce.